Ludwig Roth von Schreckenstein was the son of Friedrich Freiherr Roth von Schreckenstein (1753-1800). He was employed at the Saxonian court and in 1809 he became an officer in the army. In 1812 he was in the Napoleontic Army that went to Russia and he distinguished himself during the battle of Borodino. In 1815 he joined the Prussian army and he fought at Ligny and Wavre. In 1824 he was stationed in Düsseldorf, where he married Gräfin Luise von Hatzfeldt-Trachenberg (1800-1835) in 1828. He was promoted several times and in 1837 he was put in command of the 13th cavalry brigade in Münster. During the revolution of 1848 he commanded the 15th division in Cologne. On June 25th he succeeded August von Kanitz as Psussian Minister of War. After fights between soldiers and civilians he resigned on July 31th, 1848. He held further military positions and became a general in 1853. In 1857 he was decorated by the Hohenzollerns. 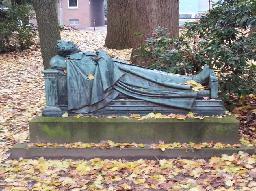 He died in 1858 in Münster. The grave of Ludwig Roth von Schreckenstein at the Überwasserfriedhof, Münster.